Having a clear concise message is crucial to your target market understanding what you do. Sadly, too many companies lose potential clients as a result of confusing, complicated messages. At Active Presence, we help you develop strong, memorable messages that help you win more business. Take a look at our free advice below and make sure your potential customers know who you are and what you do. All too often, speakers deliver more information than even the most dedicated audience can remember. Typically, an executive will stand up at the annual Kick Off meeting and deliver 50 minutes on the company's “Ten Strategic Directions” (none of which can be recalled by anybody during the coffee break, immediately following the session). What chance is there that these “strategic directions” will be acted on in the six months ahead? The mistake made by this corporate executive in the above example was to focus on content and not on the action he or she wanted the audience to take. That is, the presentation message. Who really cares about the ‘ten strategic directions’, if the staff are delivering great customer service and contributing to the growth and profitability of the organisation? What is my presentation message? What action do I want the audience to take after my presentation? How much an audience can remember is a point of some debate and on-going research. A reasonably safe range would be three to five points – but at the maximum that's five well- delivered points, not five bland statements in corporate-speak, delivered by a grey-suited business spokesperson, in a dull, grey voice, supported by boring grey bullet-points, repeating the same dull grey words the dull grey speaker is saying. You get the picture. When creating your key presentation message it's helpful to select one that is measurable. This allows you to objectively assess the impact and success of your presentation. Objectively assessing the success of a presentation is something that is commonly forgotten about. By the way, getting the audience to fill out happy sheets is not ‘objectively assessing the success of a presentation’. What you need to measure is outcome – the action people take that they would otherwise not have taken. 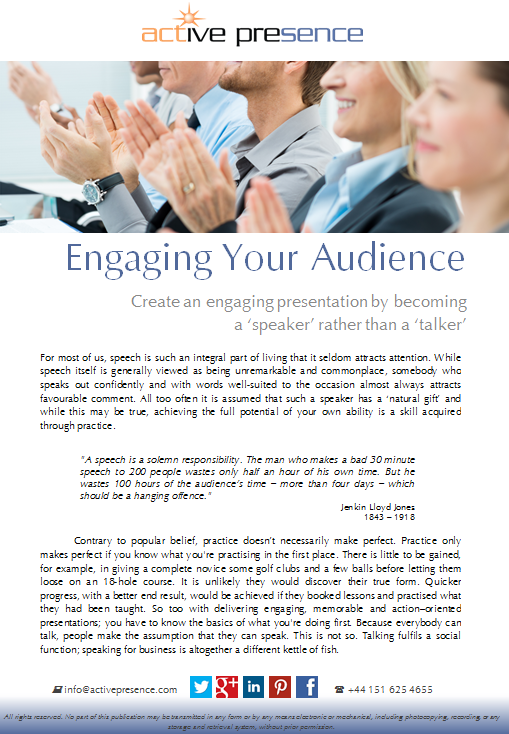 Make your presentation sales message as tight and descriptive as you possibly can. Far too many presenters start with an initial brief that is "a general introduction to the company". This is a waste of time and money, as all of this information can be had from multiple online resources; the company website, LinkedIn, Twitter, Facebook, professional associations, third-party review websites, etc. Contrast this with a presentation message that focuses the audience’s attention on a particular product or service and seeks audience engagement through offering a free trial, for example. This is a very clear, tight objective – and very measurable. Answering the question "how many people took advantage of the free trial?" gives you an immediate handle on the success of the presentation.